Parking: A public car park is located close to the hotel. The Hotel Continental Bordeaux is conveniently located in the heart of Bordeaux, where guests can enjoy the charm, refinement and beauty that lies in the wine capital. With its wonderful central located guests have easy access to the city’s excellent range of shops and boutiques. With 50 rooms, each is tastefully decorated to allow guests to feel a sense of relaxation married with a peaceful ambiance which make for care-free stay. 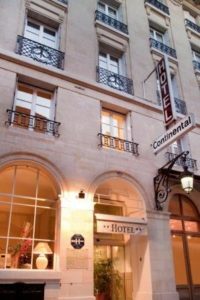 Hotel Continental Bordeaux is located in the centre of Bordeaux, on a semi pedestrian street, which allows guests easily explore the city’s shops. Bordeaux’ train station is conveniently located 3km away from the hotel, where you can take the tram, get a taxi or walk. With its central location nothing is too far away, and with the excellent service provided at the hotel, staff are happy to help their guests with travel arrangements. This house warmly welcomes you in the sophistication of this former private mansion dating from the 18th Century. Full of character, this establishment has very pleasant function rooms which allow for great events to take place! With its excellent city location, guests have easy access to the sites of Bordeaux, since June 2007, Bordeaux has been declared a UNESCO world heritage site and allows you to get a sense for French culture. As well as Bordeaux being well known for its excellent range of cultural sites, it is also well known for its gastronomic restaurants and excellent night life. Each room is tastefully decorated creating a sense of relaxation. Each room is equipped with air conditioning, TV, bathroom amenities and a hairdryer.